To get oneself talking, ask oneself a question. 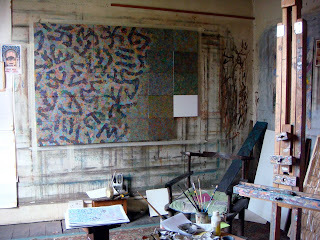 One reason for laying down the splodgy field of random colour is to have something to respond to other than the frightening white of a newly primed panel [see the unworked panel here in the southeast of the painting ]. Even as a child my first instinct was to mess up the paper before beginning, hoping to find in that mindless confusion of runny posterpaint some suggestion of event. Although I did not know it at the time this is Leonardo's recommended method for the young artist whom he instructs to gaze at a stain on the wall until landscapes emerge and are peopled with figures. With my painting, by perverse extension, I set up one abstraction to feed another. In addition to banishing the virginal white [the only time any picture is perfect] I thus drive away the fear of finding no colour in my head. For I am not one of nature's born colourists. Just as at art school there will always be, amongst one's fellow students, one that cannot make an awkward or ugly mark there will be another who is tone perfect… I can see her now… she has put down a vibrant crimson and is mixing some kind of twilight blue… and yes, it nestles against the red. Each makes the other sing… and now a yellow green satisfyingly completes the chord. Such harmonic certainty one can but envy and congratulate, and then pass on to find one's own mode of plundering colour's endless resource. The same has been the story in my musical life where I have struggled to attain even a modestly reliable sense of relative pitch. It was through music in the early sixties that I found release. John Tilbury was my mentor and through him I became friends also with Cornelius Cardew, Christian Wolff and most especially with Morton Feldman. I learned to value every and any combination of notes and timbres. So, by analogy, I saw that there were no colours that did not go together. Each conjunction has a character and reverberative identity to be sought and used. To free myself further from the Euston Road I also used chance (via the I Ching via John Cage) to trap myself into making bolder decisions. I found my motto in the usual place – the inexhaustible pages of A Human Document. 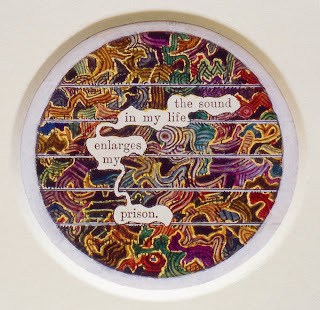 The process of mining such fragments from Mallock's text, I suddenly realise, is the mirror image of making this picture; working over the colour field, selecting parts of it and using the shapes that eventuate. With A Humument I am of course, by mining his field of verbal colour, standing on someone else's shoulders, whereas here in the painting (despite the anatomical difficulty) I am standing on my own. In music one plays best by listening, even just to oneself. When I'm improvising at the piano (the only kind of playing I do these days) it is by hearing some shift in the bass that I am made to divert the right hand from what it was poised to play and reach for something more inventive. I am not much of a pianist so I need my own self to give me all the help I can get, and then not to be afraid to take it. Slowly one makes progress. I used to be scared of yellow which I never seemed to be able to control. Now I've learned to let it have its way. I have, however, yet to learn to use black confidently as a colour. Perhaps not being a natural colourist has had its advantages since I've been forced into discoveries by treating all colours alike: it is a version of democracy. Great blog. I love the idea of colour democracy. Thanks for the inspiration. Maybe your picture sounds like a colour fugue? Just discovered your blog. Really interesting and an insight into how it's all done. Very different from my desk job. Will keep reading..